Saving money at Starbucks: A roundup of holiday deals to look for. There are few good deals happening now at Starbucks, and I thought you might be interested. Lots of people want to save a little money when they go to Starbucks. 1. 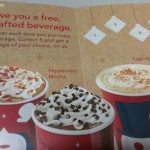 Holiday Tasting Tour Booklet – Buy 5 holiday drinks, get one free. 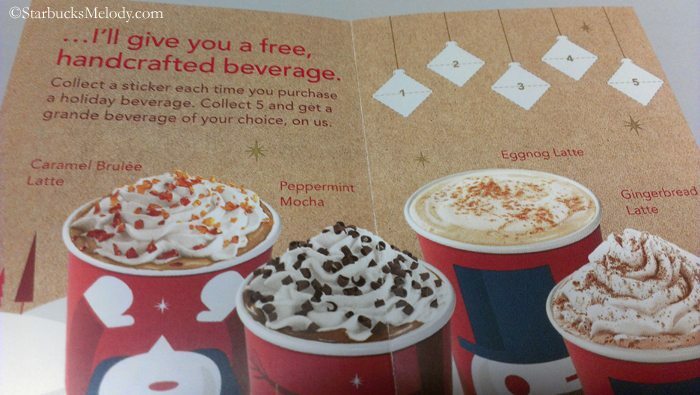 After you buy five holiday beverages (Caramel Brulee Latte, Gingerbread Latte, Eggnog Latte, and Peppermint Mocha), you can get your sixth one free. The free one is for a “Grande” size drink. You collect a little red sticker, and place it in the holiday tasting booklet. This promotion runs from November 19, 2012, through January 2, 2013. Of course, if you are paying for your holiday beverage with a registered Starbucks card, you’re still earning a “star” for that beverage too. 2. CyberMonday – I’ve heard about Cyber Monday, but haven’t seen any official materials on it. It appears to be a promo for StarbucksStore.com. Spend $60 at StarbucksStore.com, and receive $20 off your order, valid on Monday November 26, 2012 only. From Twitter, I’ve heard that this includes free shipping as well, but don’t have any official word on that yet. I might pounce on the “Cyber Monday” offer. There are several items at StarbucksStore.com that I’ve been eyeing for over a week. In particular, I really want this Puerto Rico coffee, available as an online item only! I’ve had Starbucks’ Puerto Rico coffee before, and I know it’s a nice treat. Actually, I now need a grinder at home, and I’ve been eyeing this one here. The one thing I really wanted sold out super fast. Starbucks briefly offered a 2012 collectible holiday ornament bedazzled in crystals, available only on StarbucksStore.com. Sadly, it sold out quickly. 3. 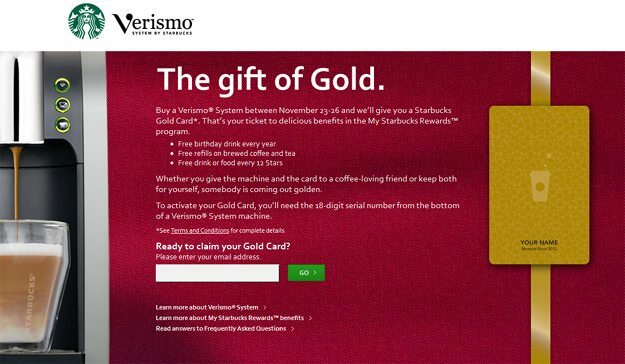 The Verismo has the Golden Touch: Black Friday Gold – Starbucks Gold: Starting on Friday, November 23 through Monday, November 26, customers who purchase the Verismo™ System by Starbucks at participating stores will receive instant Starbucks Gold Card status and all the delicious benefits that come with it. Once you buy the Verismo machine, you’ll need to go to www.Verismo.com/Gold and input the serial number on the bottom of the machine. The website will walk you through the steps of instant gold! Enjoy your special Starbucks offers! People Really Do Win in the Starbucks For Life Game! Starbucks Reserve® Brazil Fazenda Apucarana and Starbucks Breakfast Blend (Coffee Tasting). Does Starbucks need to recalibrate their customer service? Melody maybe I am a bit jaded but these promos are ok but not ones I would particularly use. Sometimes, I think SB does not look at their whole demographic audience when creating promotions. There are no Seattle Best Coffee places around here. I do, however, appreciate that there are offers people can get. Purple1, what would you have liked to have seen as a promo? I should have ended this blog post with the question, “What promotions do you want to see Starbucks offer?” because it’s a good question and I bet lots of readers have interesting answers! I knew about the 5-drink promo quite a while ago and I think it’s a good one. These aren’t drinks that I would normally get, but can get one for someone else…especially the peppermint mocha. I was wondering whether we would get a ‘sticker’ when using a ‘reward’ for the drink and it appears that yes, we do. At least that’s been my experience. I just took advantage of the Tazo buy three in the grocery store and get a $5 gift card offer. I understand perhaps these promos are centered around the holidays which makes sense for sure. Perhaps, SB can offer 10-15% off any item purchased instore for two weeks or a month? Or another option perhaps in a month period purchase a certain amount instore regardless of food or drink and get extra reward stars or a gift card your choice. (as some folks do not have a registered card). I think I heard they were bringing back the free coffee tumbler or some variation. 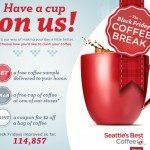 That one about burned me out on Starbucks earlier this year – way too much Italian roast and the tumbler was horrible quality – I actually chucked it into the recycling bin before the end of the promotion. I personally like the bogo whole bean coffee promotion. I know the old policy was to never discount whole bean but it was nice the last few years to stock up on Christmas Espresso roast at a discount. I guess we will know more when the 12 days stars to roll out. I might use the cyber Monday shopping deal as FREE shipping and $20 off is a bargain. I didn’t know about the buy 5 get one free promo but what frustrates me is WHY isn’t the pumpkin spice latte included as a holiday drink? It is a seasonal holiday drink as far as I can tell so why is it excluded? The other drinks are not my favorite but I could make due with a caramel brulee latte if I must. My favorite promotion is the buy one get one free on the bags of Christmas blend. I would stock up and give it for gifts. and, was just about to say what Kurt said: I think most of the partners are being pretty lenient with what’s “holiday”. I’d just hand them the booklet if I’d bought a PSL. ??? From talking to an associate at the Fullerton CA Starbucks, 12 days of Christmas will start December 13. There is a high possibility of the tumbler coming back from my brief conversation, which means one needs to come in early. This time, they may enforce a limit of one per customer – there were quite a few people reselling those last year. @Calwatch – Thank you for the scoop! 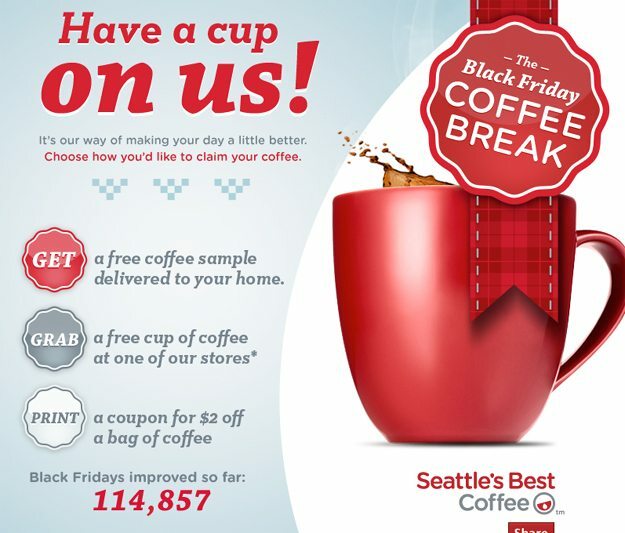 I’d definitely want one of those special free-brewed-coffee tumblers again. The Cyber Monday deal sounds pretty good. Happy to hear about the possibility of the free coffee tumblers. 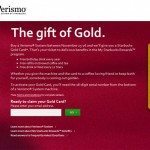 I’m seriously contemplating buying a Verisimo but as a gold card holder (and all my friends/family that drink coffee have cold cards), that deal is a definite let down from the SB marketing department. Well the great deal of free 2-day shipping in addition to the $20.00 discount for MSR Members is no deal. I had a cart of over $90.00. At check out the $20.00 was deducted but when I put in the MSR2DAY code it changed shipping to free 2-day (-$14.95) and it took $14.95 away from the $20.00 discount so that the discount was now only $5.05. Sorry Starbucks, no order for you today. BTW, still no sign of my “free” Verismo. I guess it goes with the vanishing discount. DadCooks – Boo on Starbucks! That’s no good to hear. That’s not a good cyber monday deal after all. I’ll just go buy a cheaper grinder in person in the stores. I put $100 worth of stuff in my cart, got $20 off and free shipping since I still had over $75 worth. I knew nothing about any free 2 day shipping so didn’t have a promo code for it. But Starbucks ships quickly I think so this was good for me since most are gifts and not needed immediately. Says it starts Dec 1st…any truth to this or the above mentioned deals?